The Interface Preferences dialog can be used to customize the behavior of the RTW user interface as well as setting default values for the RTW engine dialog boxes, e.g. for Quick Quotes. For RTSHARE users, the Interface Preferences dialog includes an RTSHARE tab for default_server. 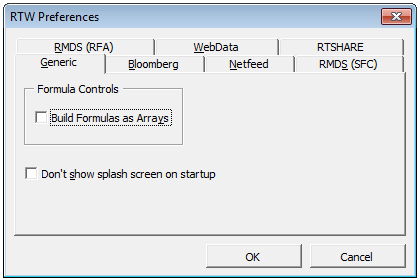 This dialog box contains a generic preference tab as well as tabs representing the installed and licensed components, such as RTSHARE and/or the engines RMDS (RFA), RMDS (SFC), Bloomberg, Netfeed, and WebData. Turn this option on to suppress the Vistasource RTW splash screen when you launch Microsoft® Excel. The option is off by default. The RMDS (RFA) tab contains option Default Service. Set the default subscribe and publish services for the RTW RMDS (RFA) engine. The selected subscribe service will automatically be the default service in the quote dialog boxes. The selected publish service will automatically be the default service in the publish dialog box. The RMDS (SFC) tab contains the option Default Service. Set the default subscribe and publish services for the RTW RMDS (SFC) engine. The selected subscribe service will automatically be the default service in the quote dialog boxes. The selected publish service will automatically be the default service in the publish dialog box. The Bloomberg tab contains the options Default Service and Field List. Set the default subscribe record type for the RTW Bloomberg engine. The selected record type will automatically be the default record type in any dialog box that includes an option for selecting record type. The Bloomberg-specific values are TICKER, TCM, TICKERX, CUSIP, CUSIP8, CUSIPX, EUROCLR, ISMA, SEDOL1, SEDOL2, CEDEL, WERTP, RGA, ISIN, DUTCH, VALOREN, FRENCH, COMNUM, JAPAN, BELG, DENMRK, AUSTRIA, LUXEMBRG, SWEDEN, NORWAY, ITALY, JNCOMNUM, SPAIN, FIRMID, MISC, AIBD, CINS, SCM, STCM, TICKERDIV, CLIENTPORT, TCA. Set the field name display option for dialog boxes. Choose “Mnemonics first” to show short field names first, e.g. ASK (Ask Price). Choose “Description first” to show long field names first, e.g. Ask Price (ASK). The Netfeed tab contains the option Default Service. Set the default subscribe service for the RTW Netfeed engine. The selected service will automatically be the default service in any dialog box that has a field for selecting services. Set the default subscribe service for the RTW WebData engine. The selected service will automatically be the default service in any dialog box that has a field for selecting services. The RTSHARE tab contains the option Default Server. Set the default server for RTSHARE. The selected server will automatically entered in the Server field in the RTSHARE Insert and Request dialog boxes as well as in the Server field in the RTSHARE Admin Window when accessed on a RTSHARE Client machine..